one must keep in practice. This article was provided by MeetWife Dating site. How many times have you had doubts as to whether a girl wants you to approach her and ended up taking no action? Have you waited for some signs? Most men really want to see some indications of woman’s interest in them before they can go and talk to her. 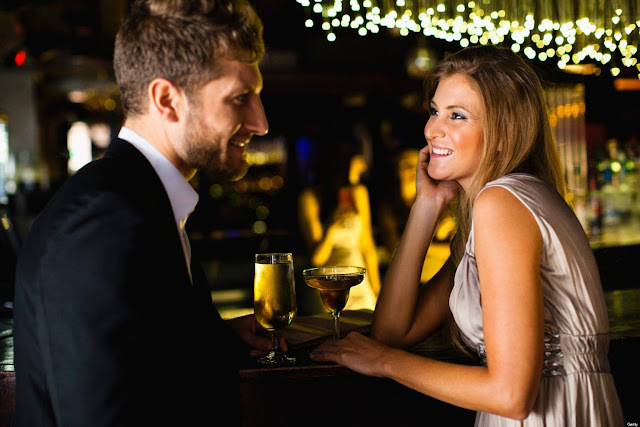 Since it’s not common for women to make the first move, all a woman can do to meet a guy she liked is to signal that she wants him to approach her. Men often can’t decipher those signals so Russian wives had decided to help them and compiled a list of women’s invitation signs. People maintain prolonged eye contact only if they are interested in a person. If you spotted a girl and you want to know whether she minds your coming up to her, try to make eye contact with her. If she ignores your tries and turns her head away from you once she notices your look, it means she is not interested in you. If you’re in a crowded place such as club or bar, you should look around and watch other girls trying to make eye contact with you. She is giving you a sign if she waits until you look her in the eye, then looks away, and after that looks at you again with a smile on her face. Even if a woman isn’t bashful and would easily approach a guy she liked, she won’t do that because she wants a man to make the first move. On her part, she’ll be sending more intense signals. First of all, she’ll enable an intimate gaze. She will openly look you in the eyes, then shift her gaze to your chest, and return to your eyes again. She may choose another strategy: firstly, she’ll make eye contact with you, then demonstratively look around as if looking for somebody better than you, and finally look at you smiling. Some confident women may even wink at you or bite their lips once they catch your eye. This is their sign for your action. Very often our bodies can tell more than our words. There are some gestures and body positions that we can’t control but they speak volumes. If a woman is interested in a man, she unconsciously starts sending him invitation signals. Putting in order her hair and clothes is one of them. If she plays with her hair, strokes her wrist or neck, she also wants to show you that she is available for communication. Pay attention to her posture: if she sits or stands in an open position and her arms are not crossed, she is ready for new acquaintances. A tricky thing about body language is that one sign can mean nothing, that’s why you should look for more indicators to make sure she wants you to approach. If you’re at the bar and a woman passes you by accidentally shouldering you although there is plenty of room, she must want to get your attention. Also, she may just come closer and stand in your vicinity periodically casting side glances at you. Close proximity is another women’s strategy to show their readiness to be approached. However, you shouldn’t mix those signs up with forced proximity and genuinely accidental collisions when you’re on the dance floor. Very insightful, Lux. Thanks so much for sharing. It's been so long I don't remember, but these all sound right to me. You have to let the guy know you're interested and then let him take it from there. Have a great week, dear friend Lux! Hmm very interesting - I might have to pay a little more attention in case I'm ever doing any of these accidentally haha! Have a great week ahead..
Heehee. These are so true! Very good collection of social cues. Some of them can be used to simply make new friends. Sometimes friends become lovers, sometimes not. I met a new friend in a library in 1968. We have 4 grandchildren now. Quando estamos na vibe de alguém mandamos mil sinais. Mas às vezes isso não é o suficiente! hahaha! body language says it all ... or maybe more than we ever realized, huh? It's tough for men to know when to approach women so hopefully your post will give them plenty of pointers! I agree to all this. Nice read. I am sure there are more than four signs. I'm actually pretty aware of this because in school we had a study of human behaviour lesson where we also deduced the movements that ladies and males too make in order to interact or show interest. It's amazing what small and subtle things we sometimes do! Thank you very much, valuable clues, I've always been very clumsy! Hehe, what a nice article! I guess I agree with you because all of these tips are so true! It's been so long since I've been in the market, but you're spot on. Body language is the key, eh? Hehe! I agree with eye contact! Most things that you say don't come out of your mouth.. body language and eye contact is always a sure way to say you're interested. Very nice post. I remember doing all of these things when I was single! Thanks for sharing Luxxy!! You Rock! Mwaaah! I enjoyed reading this. All very factual. Now the cat's out of the bag, lol. Yes. But please remember if you have misread - no DOES mean no.